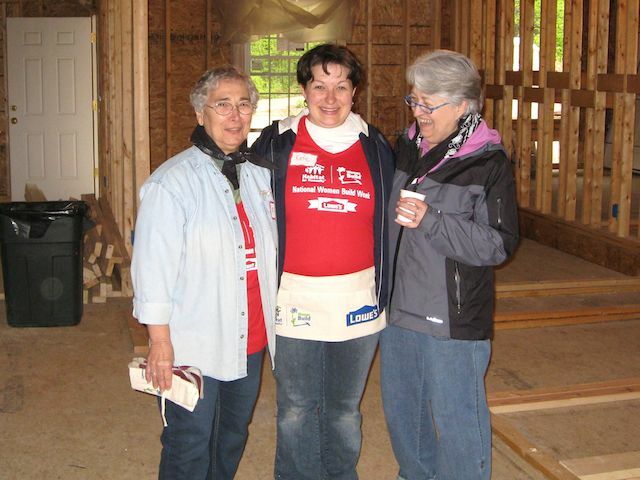 On Saturday, May 11, the day before Mother’s Day, more than 30 women from all walks of life, gathered in Conway to participate in the 6th Annual Women Build. Each year, Lowe’s has generously signed on as Women Build underwriter by offering “how to clinics” and project support. The Mount Washington Valley Affiliate will receive a Lowe’s Gift Card worth $5,000 for its participation. Though the skies were damp and gray, spirits and enthusiasm were high. Kate, the new homeowner, was on site with her mom, Mary and her husband’s grandmother, Elva (who has built a few homes in the past!) The three beamed with pride as they spoke of what Kate called, “an amazing opportunity” for which she is very grateful. As the day progressed the women worked on a variety of tasks from putting up siding and framing windows and walls to installing foam for insulation. Snacks and lunch were generously provided by the Altrusa International, Inc. of Carroll County, Harold Rodgers, Spring Hill Water, Hannaford, Shaw’s, Walmart and Big Dave’s Deli. At the end of the day, there was indeed a sense of accomplishment for a “job well done”. Participants were given a carpenter’s pencil and the instructions to leave a note of blessing, prayer or well wishes on the interior walls. These positive’ thoughts will soon surround Kate and her family as they begin living in their new Habitat home! Women Build 2012 Looking for families for our new project!